Departure time: Monday - Sunday: 14:00. The tour runs year round though it's most fun in the heat of spring and summer. We are comparing Budapest Highlights Bike Tour Prices from leading ticket suppliers and Try to find you Cheap tickets prices on the market. You’ll cycle through City Park, Heroes’ Square, the Jewish Quarter, down Andrassy Street and along the Danube River. It’s an interesting way to learn the history, culture and secrets of the city, all while on the move on two wheels. Your Experience With Budapest Highlights Bike Tour? The tour sticks largely to bike lines, so there’s no need to panic about traffic. Cycle over to Liberty Square before passing the Hungarian Parliament building and along the Danube. Visit Heroes Square for a history lesson on archangel Gabriel’s legend from your guide. 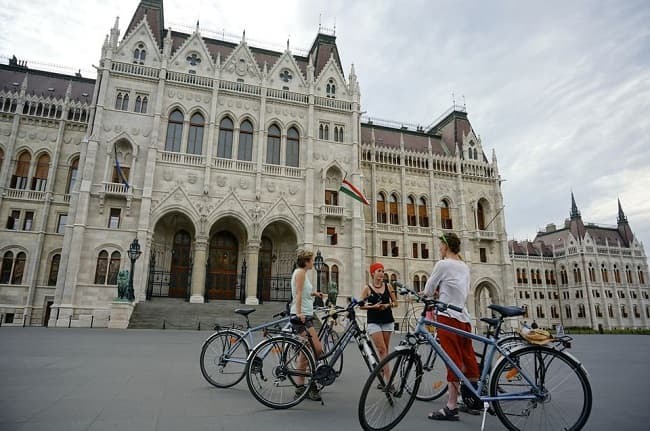 What Budapest Highlights Bike Tour Includes? Make sure you bring a bottle of water to keep hydrated. Travelers Reviews about Budapest Highlights Bike Tour? Tickets booked through Tiqets can be cancelled for a full refund 24 hours in advance. Tickets booked through Viator can be cancelled for a full refund 7 days in advance. High fitness levels aren't required to take part in this tour, you just have to feel comfortable riding a bike! Meeting point: The Basilica, Szent István tér 1, 1051, Budapest.